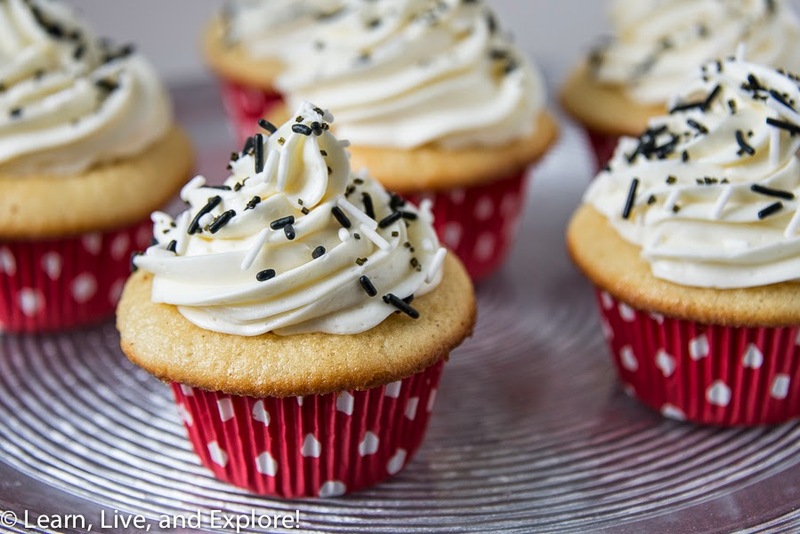 Mickey Mouse Cupcakes ~ Learn, Live, and Explore! 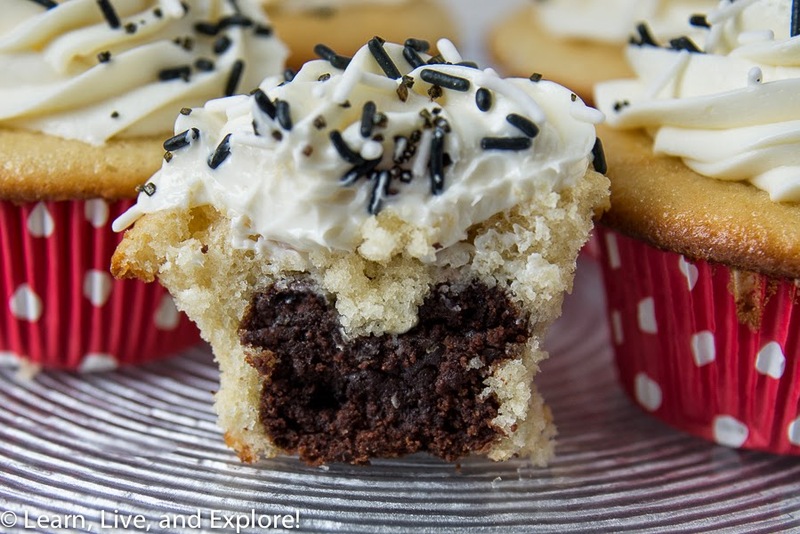 Today's baking inspiration comes from the How to Cook That website. I've been wanting to try out a "surprise inside" style cupcake for a few months now. And while I'm not 100% satisfied with the result, it was a great learning lesson. Plus, the cupcakes were for a friend's birthday who is gonzo about Mickey Mouse. So even if the cupcakes didn't taste as good as I would have hoped, and even if the Mickeys resembled more of a teddy bear because I made the head part too big, and even if the cupcakes tipped over during rush hour traffic trying to deliver them to her house...well, I can call it a success because the thought was there, which is the most important part about a birthday present, right? Like I said before, I'm not completely gaga over the taste of both the chocolate and vanilla cakes, but I recognize that for this type of cake, a dense cake works better to maintain the shape of the object inside. If I were to do it differently, I would definitely have made smaller Mickeys to allow more room for the white cake border. For the recipes, I'm not going to copy them down here because it's just as easy for you to click in the beginning of this post. I do want to highlight a great video the blogger put together to walk you through the process. 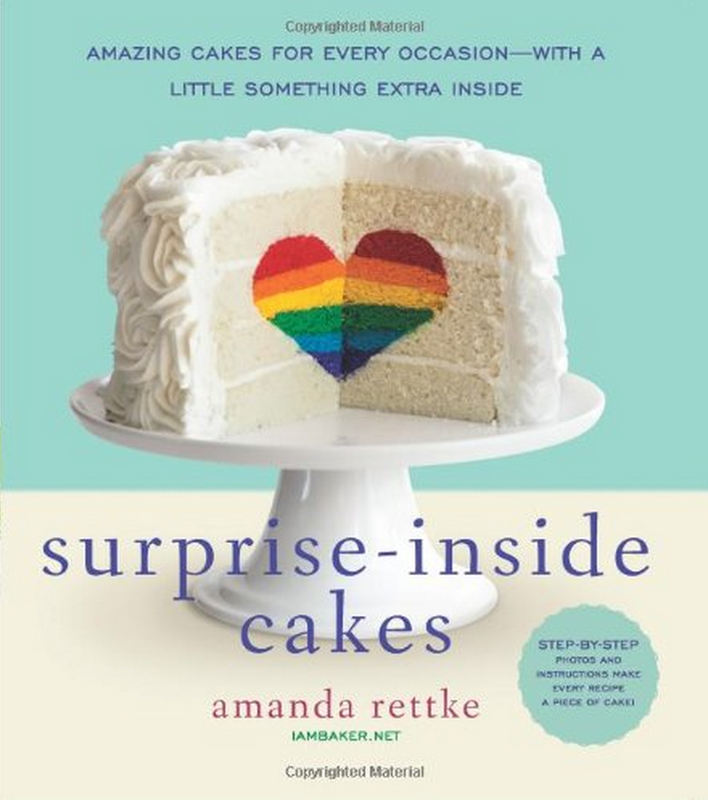 For more on surprise inside ideas and instructions, check out the i am baker blog or just buy Amanda's book on Amazon.